Suite No. 1 in C Major, Suite No. 2 in B Minor, Suite No. 3 in D Major, and Suite No. 4 in D Major. Bach-Gesellschaft edition. lnstrumentation. Notes. 112pp. 6 1/8" x 8 1/2". 40863-9. The crowning glory of Bach's achievements in the field of sacred music, this work is scored for two sopranos, alto, tenor, bass, chorus, orchestra, and continuo. Authoritative Bach-Gesellschaft edition. 320pp. 5 3/8" x 8". 40417-X. Our price: $8.95 + $10 shipping for first item, others $6 each. Our price: $24.93 + $10 shipping for first item, others $6 each. No. 1 in F Major, No. 2 in F Major, No. 3 in G Major, No. 4 in G Major, No. 5 in D Major, and No. 6 in B-flat Major. 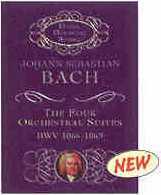 Reprinted from definitive Bach-Gesellschaft edition. 192pp. 5 3/8" x 8". 29795-0. Our price: $23.93 + $10 shipping for first item, others $6 each. Great choral masterpiece, long considered the noblest, most inspired musical treatment of the crucifixion of Christ, is scored for a vast ensemble of double chorus, soloists, double orchestra, and two organs. 304pp. 5 3/8" x 8". 40635-0. Our price: $12.95 + $10 shipping for first item, others $6 each. Our price: $33.94 + $10 shipping for first item, others $6 each.